Coffee, to play along with the over-caffeinated writer ethos. A list of cheers to work from is helpful. Strongly Discouraged: One very specific cat who will require a run to the ER at hour 32 after he fell into a bucket of paint. Ahem. Then one may pop a little with pride. Congratulations, Heather!!! 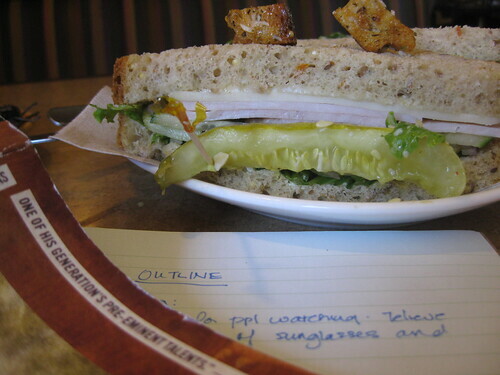 « Day two of the 3-Day Novel Contest at the Banff Centre. Fell into a bucket of paint? Eek! With distractions like that, Heather’s achievement is all the more remark(CAKE!)able. Congratulations! Thankfully, *I* did not fall into the bucket of paint. I mean, I may have crazy hair and all (the altitude, maybe?) but I’m not so badly in need of product as that.